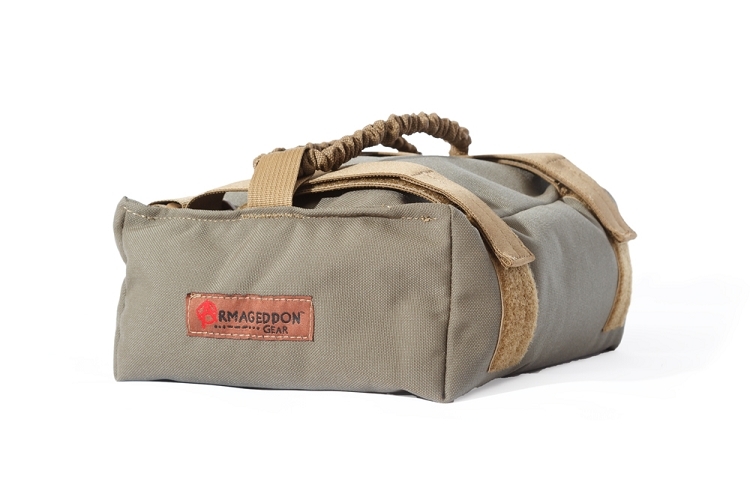 Armageddon Gear Fat Bags are an ultralight and versatile solution to a rifleman’s need for weapon and body support in the field and on the range. The Fat Bags feature a Cordura nylon outer shell filled with airweight beads. Dual elastic straps fasten with Milspec Velcro and can be detached on one end for rapid and easy attachment or detachment to yourself or your equipment. The included Bungee Gear Lanyard and ITW Nexus Tac Link allow easy attachment to belt loops or equipment and easy use in a variety of positions without the need to removed the tether. No other support bag offers the combination of light weight, convenience, security and speed of the Fat Bags from Armageddon Gear! Available in two sizes; a rectangular medium Fat Bag and a tapered-rectangle large Fat Bag.